The Marshall AS50D 50 Watt acoustic amp returns in a sleek, limited edition black colouring. Compact and portable, the Marshall AS50D i.. The Marshall AS50D 50 Watt acoustic amp returns in a sleek, limited edition black colouring. Compact and portable, the Marshall AS50D is perfect for the acoustic player who wants to get out there and gig. As the Marshall AS50D Soloist acoustic guitar amp comes ready with two channels it is perfect for amplifying both your electro-acoustic guitar and your vocals. Channel 1 has a standard quarter inch jack input so you can hook up your guitar while Channel 2 has a quarter inch and XLR input, with the XLR input providing phantom power to extend your microphone options. Have your guitar running through channel 1 and hook up a microphone or other instrument through channel 2 and you’re ready to start the show. It’s not just for guitars though; the AS50D has been designed with a range of input features to add flexibility, meaning it can accommodated instruments with magnetic pickups, piezos and microphones – either passive or condenser. The second channel also has phono auxiliary inputs so you can hook up a CD player, mp3 player or other audio device – great for playing some pre-recorded music between sets or even backing tracks to accompany your live performance. A typical pitfall of amplifying an electro-acoustic guitar is unwanted feedback that can spoil an otherwise great performance. To aid you in eliminating this, the Marshall AS50D has a number of anti-feedback features such as a Phase switch and a frequency controllable Notch Filter. This useful combination of features allows you to zone in on the frequencies where feedback occurs and eliminate them so you can carry on with your performance feedback-free. 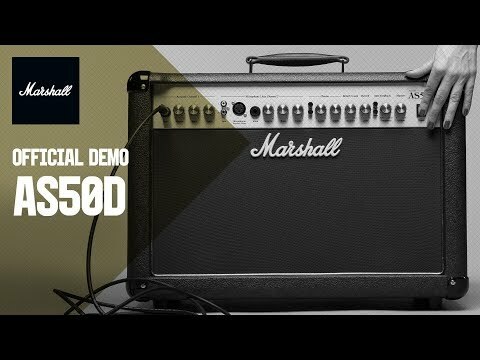 As this is a Marshall amp, you can be sure that the Marshall AS50D brings with it the same top-end audio quality that Marshall amps are famous for. The AS50DB features two specially designed 8” Celestion speakers and a high-fidelity polymer dome tweeter so it can produce some sparklingly brilliant highs and rich clean tones. Each of the two channels has its own volume, bass and treble controls so you can mould each channel’s sound to your exact liking. In addition to this, you can further tailor your tone using the great Chorus and studio quality Reverb effects the Marshall AS50D has built-in. These digital effects can be assigned to either or both channels and balanced with FX in the FX Loop while a series of dedicated controls allow you to get the effects just right for your requirements. When developing the AS50D Acoustic Soloist, Marshall Amplification have spent a great amount of time and put a lot of research into ensuring the sound is as natural as possible. Designed to the highest possible standards, the AS50D will stand the test of time. Thanks to its small size, low weight and the comfortable handle attached to the top of the amp, the Marshall AS50D is the perfect companion for any gigging acoustic performer. Great quality audio, flexible options and studio level effects make the 50 Watt AS50D an incredible acoustic guitar amp that is perfect for intimate performances.